How many times have you tried to book a tatkal ticket and failed? Have you booked a tatkal ticket online at least once in your lifetime? If you ask this question to everyone out there, you would get the same. Tatkal ticket booking? It’s always a dream that everyone wishes to come true. There are many who say, it is easier to understand women than getting a tatkal ticket booked!! Jokes, apart! Booking tatkal ticket is difficult than studying rocket science. Yes, it was so true. Yet, with some technological advancements and development of software, booking tatkal tickets are now made simpler, easier and literally possible. Auto Fill Extension is a great option to reduce the time consumed on entering the data during IRCTC tatkal booking. It is an option that helps you fill the details (like passenger names, age, etc) and save the details of your journey. 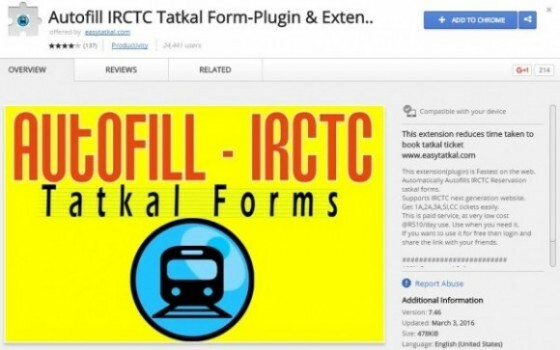 Using this extension will help you fill the data automatically during IRCTC tatkal booking. Must Watch Video to Know How it Works! Install the plugin into the Google Chrome browser and it is also compatible with Firefox browser. After installation of the plugin, open it. Fill all details of your journey. You can also fill the payment details if you are using credit card/debit card for payment. After filling the data, click ‘SAVE DATA’ option. Open the IRCTC website and log in to your account. After selecting the train and the preferred class, choose BOOK TICKET option. Click on the plugin, it will fill the data for you. Choose the PAYMENT Option and enter the details. Enter the payment details and you will get the tickets confirmed. It is a free tool! However, after booking, the site will ask for a small donation, that start from INR 10 to anything you would like to pay. This autofill extension works similar to the above-mentioned extension. All you have to do is pre-fill all the data and save it. The data filled in the extension form will be automatically filled in the IRCTC website. Besides, there is an interesting option available in the extension, which is briefed below. Install the extension to your Chrome browser and it is more compatible. This extension also supports FireFox. After installation, refresh the page and select the payment option. There are three options available, free plan, social plan and premium plan. If you choose free form, it will be enabled automatically. If you choose social form, you should share it on Facebook and it will be enabled. Enter the premium code you receive to activate the premium plan. Fill all the details from IRCTC login details to passenger details. Open the IRCTC website and the data will be automatically updated to the site. After booking the tickets, close the browser. The interesting part of this extension is “Auto Book Now.” It is an additional option that is available as a part of the form. After you enter the details, don’t refresh the browser. Whether it is 10 AM tatkal opening or 11 Am opening, the link will be automatically opened. IRCTC login session expires after 3 minutes of inactivity. So, please plan accordingly before you log in to the site. Just be careful when the site opens automatically and you can proceed with the booking. 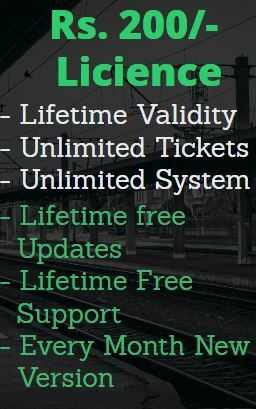 This is an additional benefit that assures getting confirmed tatkal tickets. Don’t worry if the time zone or time in your computer or laptop does not match with the IRCTC time zone. The extension is developed in tune with the IRCTC time zone and the link will be opened exactly when the tatkal ticketing hours are open. One credit cost one rupee and you can buy in lots of 10 credits or 20 credits as you prefer. Sharing the extension and getting referrals give you one credit. 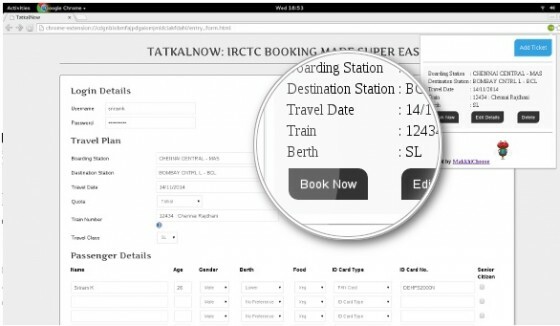 EasyTatkal is yet another chrome extension that helps you book your tatkal tickets faster in a few seconds. This extension provides a very clean and clear form to fill the details in advance. Visit the site http://easytatkal.com. The site opens with the locked/disabled form. Login to the site using your Google Plus ID or Facebook ID or you can create a new User ID. After registration, click ‘Enable’ to activate the forms. Enable the form filling feature to fill the details. Sometimes, the site may call for installation of an additional plug-in to unlock the form. The form will be unlocked. Give a name to the form, say, IRCTC from Chennai to Delhi. So, every time, for every travel (as long as the journey destination, train you prefer and the passengers remain same), you should fill out a new form. All the forms will be stored in the extensions. So, naming the form appropriately is essential. Enter the journey details – source, destination, date, quota and type of ticket. Enter the passenger details – name, age, gender, meal preference, berth preference, ID card, etc. Enter the mobile number registered with the IRCTC user account. Fill the IRCTC user ID and password. If there are child passengers, enter the details. You are done. Save the form. You need the latest version of the chromes browser to use this extension. When you open the IRCTC website to book tatkal tickets, you can see all the data being filled automatically. Known more as the best password manager, it comes handy to help you in booking tatkal tickets. Roboform is simple software that stores, generates and retrieves the password and other information required. It is available as trial software for a period of 30 days. It costs $9.95 / year. However, in case if you travel frequently, you can just buy this software and it can be used for other purposes too. Although it is a software, it is installed as a browser extension. Download the trial version of the software. If you are sceptical about the effectiveness of software, just go with the 30 days trial version. Still, after the expiry of a trial version, you can buy this tool. Visit IRCTC website and log in to the site with your user ID. Automatically Roboform browser extension will direct you to save the credentials of your IRCTC login details and password just you entered, save it giving a name, say ‘IRCTC Login.’ This marks the completion of Automated Form 1. Continuing in your IRCTC account and Choose the option ‘Proceed to Booking’ which will direct you to the page that is shown as below and enter the source station, destination, date of travel and type of ticket you want to book. Generally, you can name it logically by entering the destination. For instance, IRCTC Bangalore, when you are travelling to Bangalore. 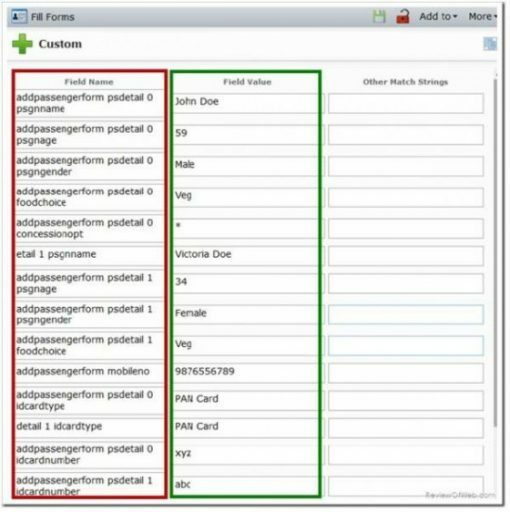 Fill the details in the FIELD NAME – CUSTOM FIELD (which is marked in red in the below image). The details in the second box, FIELD VALUE will be automatically derived from the data created in the above step, new Identity. After filling the first box, save the data. Save option is given at the top right corner of the tool. This marks the completion of Automation Form 2. Click the tab ‘Submit’ as given in the first image. Then, choose the train and class of travel as you will normally choose when you book the ticket online. Later, your screen will display the following form. 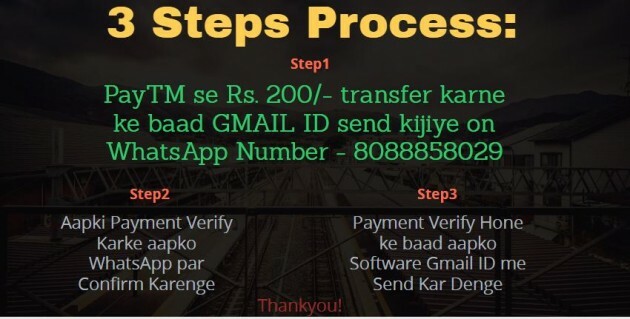 Fill the form here carefully and select the Payment Type with Bank name and click on Make Payment button. Again, create a new Identify, following the steps mentioned above. Complete creating the identity by saving the fields given in red and green. Here you will enter all the details of the passengers. It marks the completion of automation form 3. It may appear very tedious and a lot of typing work involved. Actually, it is a one time process and you can book the tatkal tickets in a few clicks. That’s it! You have all the data you generally enter while booking the tatkal ticket. Use the browser extension when you book tatkal tickets and it will load all the data saved earlier. Just by entering the payment information, you can easily get the confirmed tickets. Termed as one click icon to book your tatkal tickets, it enables getting confirmed tickets in just a few seconds. As an additional option, this tool enables the user to fill the payment details, saving a few more seconds. Visit the site, http://www.makkhichoose.com/gettatkalnow and install the software. It will appear as a plug-in as a green icon on the toolbar. Click the ‘Add Ticket’ button, enter your IRCTC login credentials, travel details, passenger details and payment details. It is a free software. The payment details you enter in the form will not be saved in the database. It is just stored as a part of the extension temporarily. Save the form. When you open the site, the plug-in automatically fills the data on each page and books the tickets. The only thing you should do is Captcha entry. 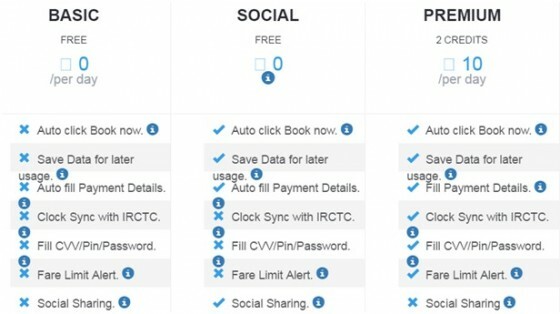 Using any of this software or tools doesn’t include any exemptions on tatkal ticket booking rules. For instance, you cannot use IRCTC Wallet to book tatkal tickets; a valid IRCTC user ID can be used only twice a month to book tatkal tickets and likewise. 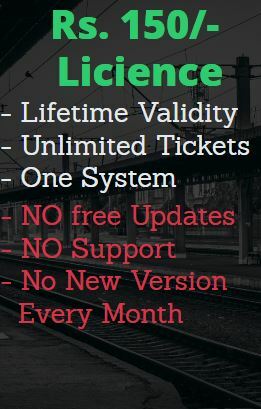 Make sure you are aware of these rules and use the software to book the tickets. You should spend some time in filling the forms with appropriate details to avoid the last minute hassles. Fill the data a day or two early before the date of booking. Don’t use all software or extensions available to book tatkal tickets quickly. You can just go for a trial booking (without actually making any payment) after the peak tatkal hours. I am very excited for your software. Tatkal Now software is good but their are many users and has heavy load on server so it comes slow on peak houe. Any new and good software? 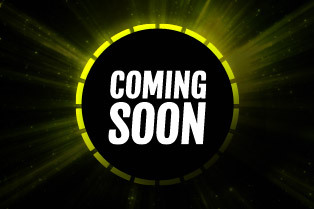 We are going to launch our own software please wait for some time. Tatkal Now Software is best one. Which i explained in number 5. THIS IS THE MOST NICE AND FAST SOFTWARE…. Also consider including Tatkal Seva for Mango People from the given link. Its first plugin that I came across which is totally free!